I'm such a fan of dippy eggs with soldiers. 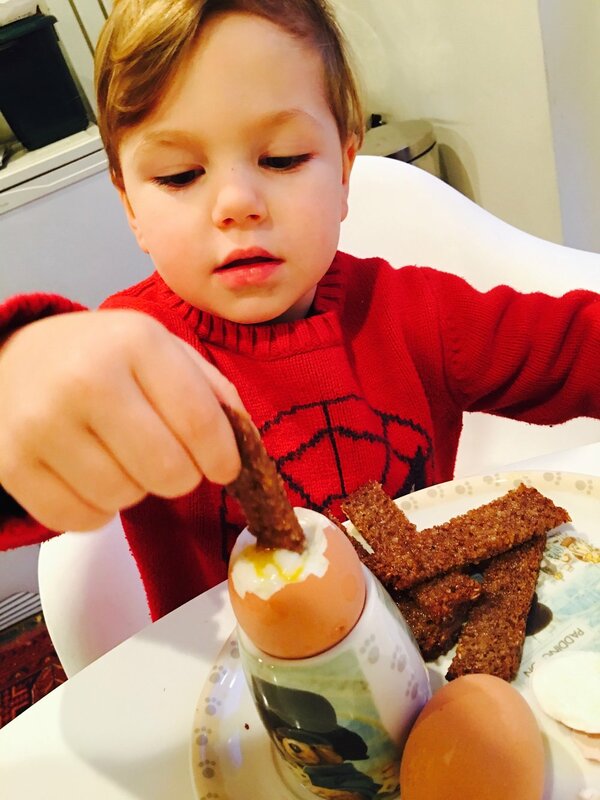 Charlie insists on helping as this is one of his favourite breakfasts, aside from my best pancakes of course! There is something so satisfying about dipping into the golden runny yolk. It's an oozing beautiful thing! This recipe was inspired by my lovely friend Chantell who sent me a recipe using parsnip chips to dip. I mostly avoid bread ( unless it's rye ) and I adore sweet potatoes as they are the closest cousin of New Zealand's beautiful purple kumera. Oh how I miss thee! 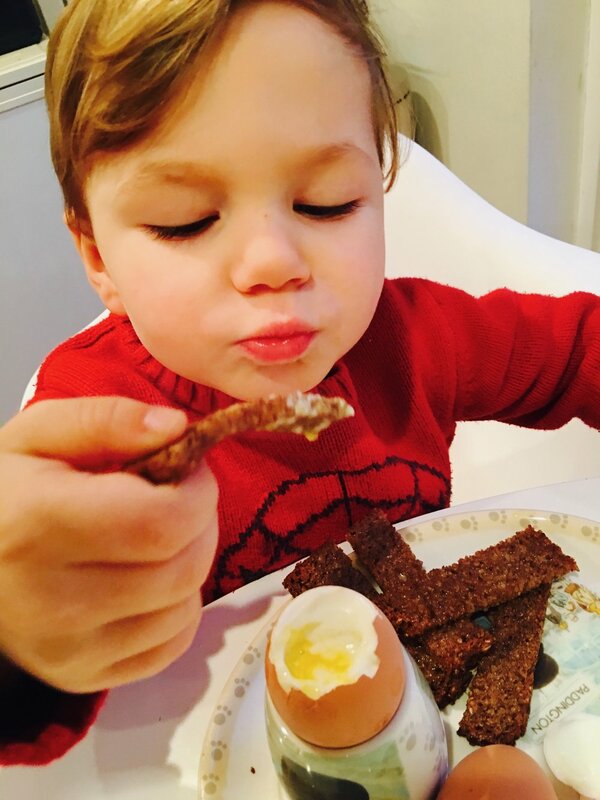 So I thought why not try dippy eggs with one of my favorites! Plus I wanted something that I knew the kids would love too, with a twist of course. If you are wondering, sweet potatoes are the better choice over starchy potatoes, they contain more vitamin C and are low GI. Super good for you and taste amazing with eggs! Double the wedge recipe below if a) your kids are greedy like mine and b) your husband doesn't like sharing his food ha ha! The wedges alone are delicious. Wash and scrub your sweet potatoes. Leave the skin on, no need to peel. Cut each sweet potato in half length-ways. Cut the halves again in half length-ways, then each piece in half again so you end up with about 8 wedges ( per potato ) about 1/2 inch ( or slightly less ) thick. In a large bowl add the wedges, 2 tsp smoked paprika and a big pinch of cracked paper and salt. Mix together until the wedges are coated. Add 1 Tbsp of olive oil and toss again thoroughly. Don't add too much olive oil as you want the wedges to crisp up in the oven or they may become soft and soggy, not ideal for dipping! Line your oven tray with baking paper and lay each piece out flat. I like to sprinkle the wedges with a little more smoked paprika here if you think they need it. Bake in the oven for 15mins, checking on them every 5mins, turning the wedges now and then. Depending on your oven and if your wedges are thicker than mine, they may require a bit longer in the oven, possibly up to 35mins. Just keep an eye on them and pull them out then they are cooked and crisp, not burnt! Meanwhile toast your dark rye bread. Mix a tsp of Smoked Paprika into a couple of tablespoons of butter and mix together. Butter your rye and cut into soldiers. Soft boil your eggs ( time will depend on the egg size and if you keep your eggs in the fridge or not ). I choose fresh large eggs from my fridge. I boil a pot of water and boil the eggs for 5mins for perfect runny eggs. Serve your eggs in egg cups with a stack of the sweet potato chips and rye soldiers! Fast, easy, healthy and super tasty. Enjoy! I’d love to hear what your thought of this recipe? Please comment below!